My 10-12 to 13-14 front end swap with pictures. Here are the parts and pictures I have compiled. I am using the Tasca Parts website, you can also use Autonation White Bear Lake as those sites are almost identical in price and function. 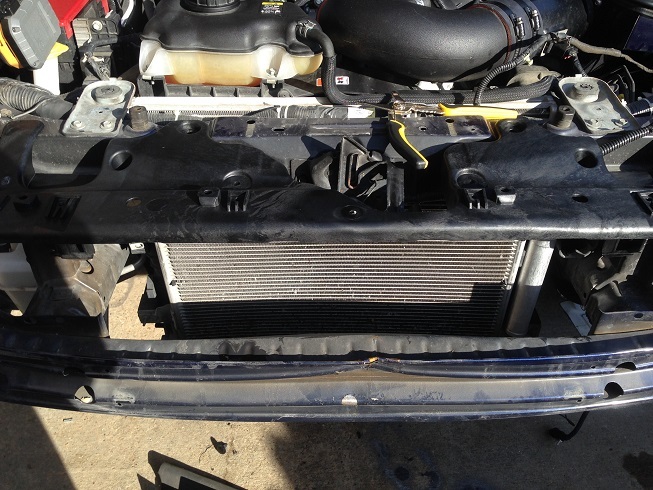 I purchased my parts from Autonation, I bought the bumper and hood local but all the rest came from Autonation. Great customer service and awesome prices. Tasca has great prices as well. Either one will be perfect to use. For anyone local to Houston Tx there is an Autonation dealership there as well and they will match the internet prices for White Bear Lake and you can avoid shipping costs. For you gents wanting to swap from teh 13-14 to the 10-12 you need to find a car that has the HID headlights. 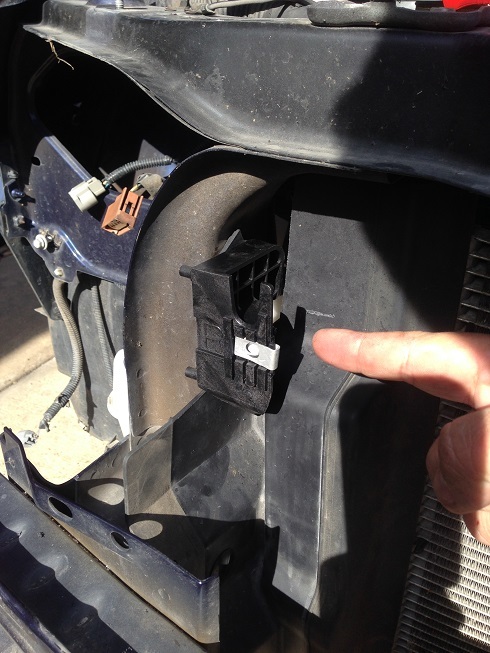 There are mounting tabs on the 10-12 headlights that hold the upper portion of the bumper. You wont be able to mount the bumper without these so you will have to swap everything including headlight or buy some aftermarket (Raxiom) headlights that support the HID's. Sorry to be the bearer of bad news. This will turn most guys off from this swap as most love the 13-14 headlights. And for you 10-12 guys converting you will have to cut the tabs off your headlights for the 13-14 bumper to fit. So get a dremel and get to cutting. Pics below. 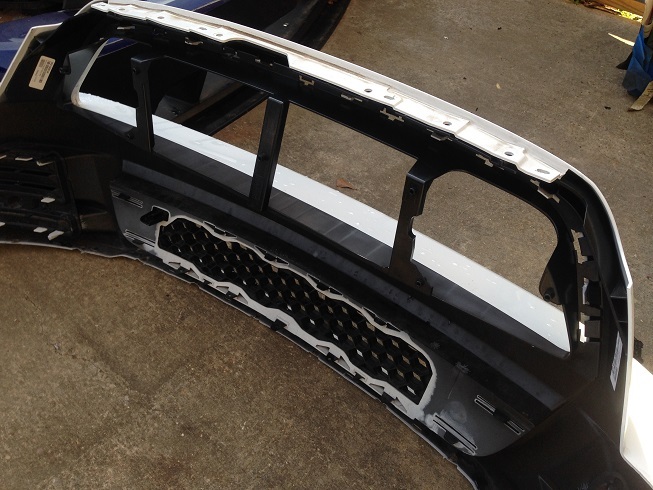 Bumper Cover: DR3Z17D957ABPTM. 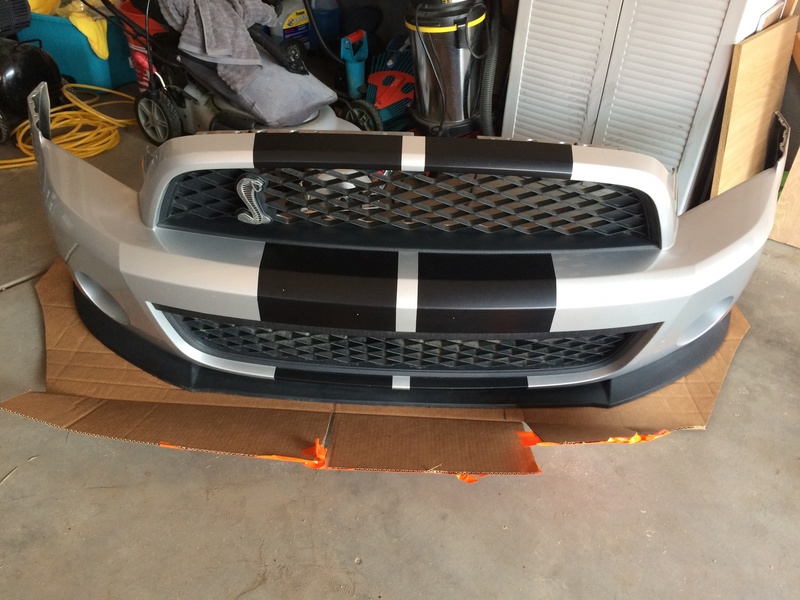 Basic GT bumper (same on all models except the GT500). No panels or inserts for the fog lights. Those can be found on Ebay or the websites above. I did not need them since they were already in the bumper I purchased locally along with the grills. Grill Reinforcement: DR3Z8A200AA. You have to have this to mount aftermarket or factory grills. Also the foglights mount to this. 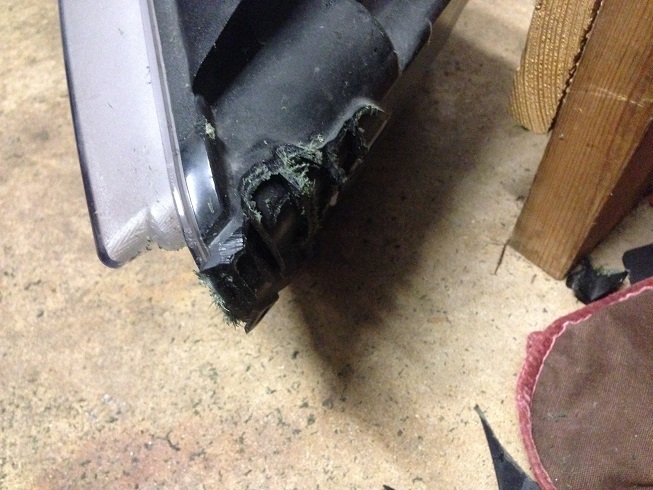 This part snaps to the back of the upper part of the bumper and then the grill snaps to this piece. Closure Panel: DR3Z8C371A. 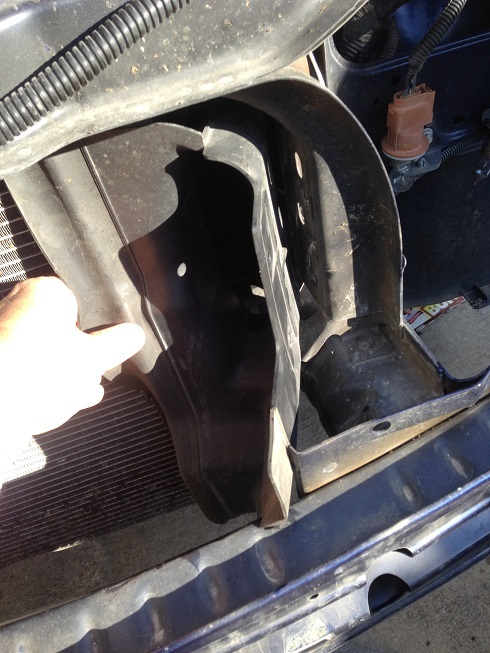 This holds the entire top portion of the bumper to the radiator support. If you don't have this piece nothing lines up. 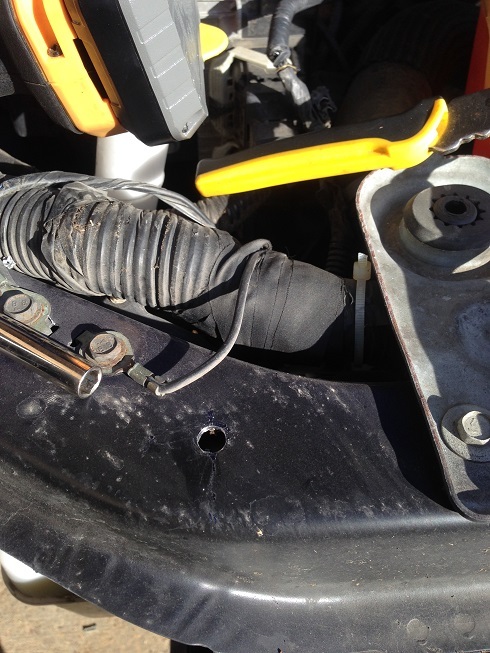 You have to drill 2 holes in your upper radiator support for this to mount properly. I lined everything up and drill 2 small pilot holes. There are 2 small holes on either side of the panel where the tabs are. The pilot holes kept my 11/32nds drill bit from "walking" as I drilled the actual holes. 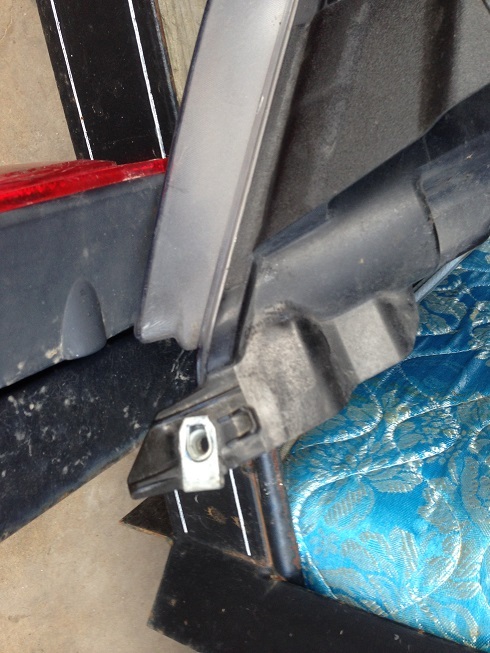 After that everything snapped into place and the lower portion mounts to the End Covers. This is the scariest part of the conversion but it really isn't that bad. End Covers Left and Right: (Right) DR3Z8C391B (Left) DR3Z8C391A. 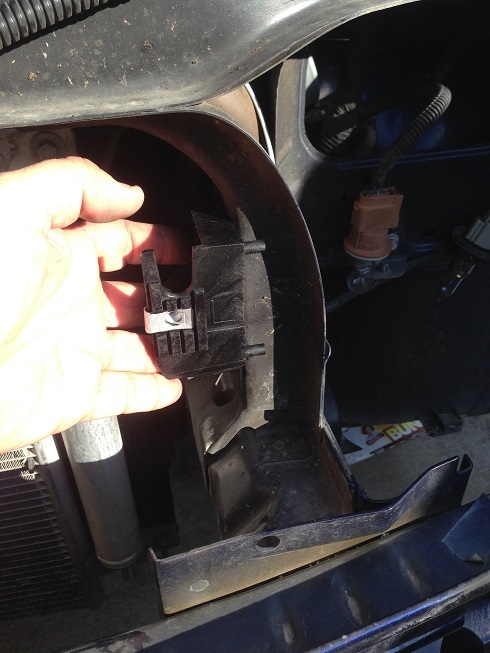 The lower portion of the Closure Panel mounts to these, they are mounted to the vertical supports on the radiator support on either side of the radiator. Splitter and Lower Shield:Regular GT Splitter, DR3Z17D957AA. If you get this one you will need this lower shield, DR3Z17626B. 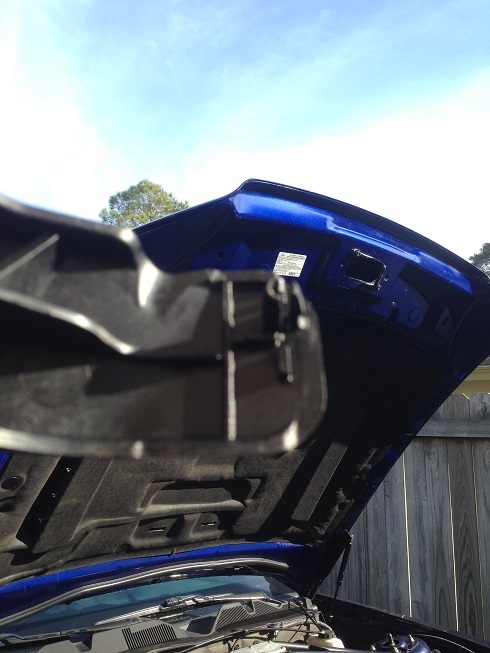 If you decide to get the Boss-GT/CS Splitter, DR3Z17626BA (expensive) you will need this lower shield, BR3Z17626A. You should not need the Absorber or the Impact bar if you are doing a direct swap, but if you need the part numbers for the 13-14 here they are. 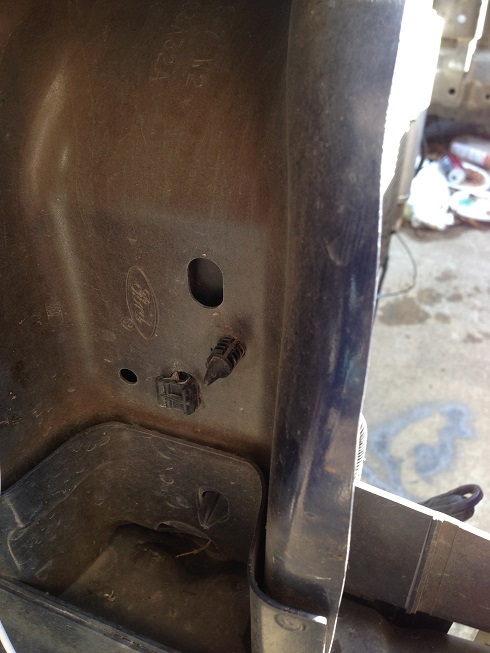 Radiator Covers: Driver side need holes marked and drilled, passenger must be trimmed for the End Cover to mount. Holes that are already behind the radiator cover. The End Covers have tabs that line up perfectly with these holes and one of the holes is for a bolt that holds the end cover. Hole for the top of the Closure Panel. Tab on the Closure Panel that snaps into the hole you drilled. Closure Panel Mounted. Snaps up top into the holes you drilled and bolts to the End Covers underneath, there are also alignment pins that sit on the end covers. 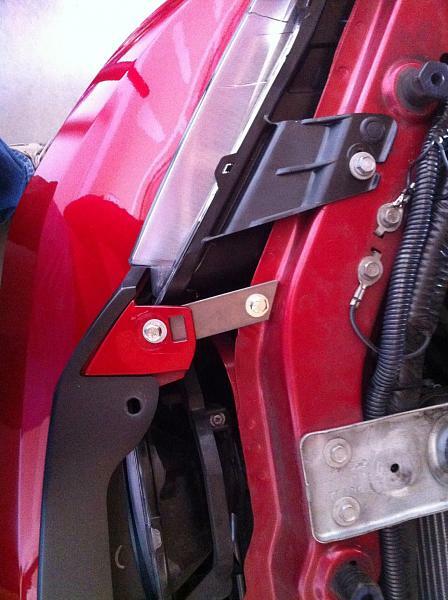 Grill Reinforcement mounted to the backside of the bumper cover. Tabs on the headlights that have to be cut. Ouch! I hate cutting stuff. I hope all this helps. I can answer any questions you have. This will not be for the faint of heart but it really wasn't that bad. I freaking love it! Can't wait till its all painted and back on the road again! Thats excellent! Thanks for the reply! Great write up. I personally hate the 13-14 front end. One thing I would like to change in the future on my 14 is to convert to the 10-12 front end. There are plenty that will trade. And unless yours is GHIG or Deep Impact Blue you can likely swap without having to repaint. You're going the wrong way. 11-12 owners are supposed to swap 13/14 rear ends ... 13/14 owners are supposed to swap 11/12 front ends. 13/14 owners are supposed to swap 11/12 front ends. That's funny. And though I'm not considering that conversion, I do think the 11/12 nose is cleaner looking than my '14. To each his own! I want the 13-14 rear as well! Great thread! I'd love to swap my 13 front end to an 11/12 as well. I have dib, so that's a bummer, but I'd plastidip the whole car if I ever did the swap. thanks for the instructions and details provided. I'm about to do the same swap on my 2011 V6 but to be honest, I'm a bit confused as to what I need to buy. Once I opened the link you provided with all the parts, ****, I got lost. I have fog lights on my car atm so I know I have to buy those to fit onto the new bumper. I need the front and back plastic part into which the actual lights go into, right? Will the screws, pins, etc. that I have on my pumper now be enough and fit the new bumper or do I need to buy additional ones? Is it my browser or are there some pictures missing or I can't see them in your thread? Pic must of expired, i had them saved somewhere, you will need the back part of the grill the holds the fog lights in but you should be able to reuse the screws from your old grill, 90% of your hardware can be reused but there are some parts like the lip on the front need new screws, as you wont have that hardware. I looked at all the parts and figured it would be quite an expensive conversion (didn't know one needs so many additional parts outside the bumper and grilles). I think I'll go for a GT bumper swap instead. 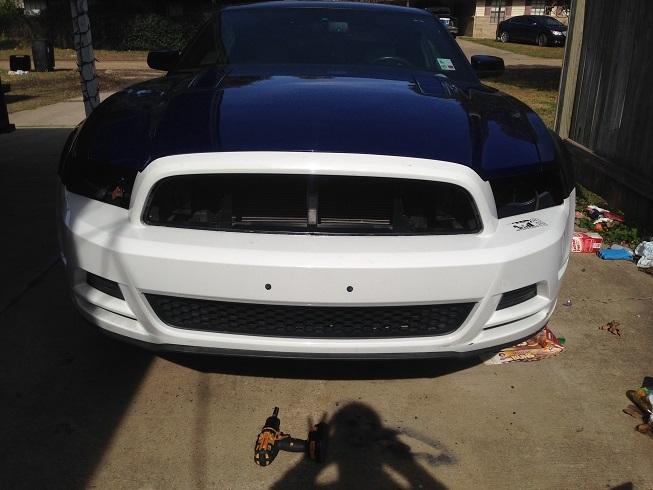 GT500 Fog Light LED Bulbs! Plug & Play install! For All Years! Matches Factory DRLs! Quick Reply: My 10-12 to 13-14 front end swap with pictures.